To enquire about making a booking, joining us or just to say Hi, please use the e-mail address provided below, or complete the form on the right. We'd love to hear from you and you will receive a reply as soon as possible! Find out all the latest news from the Dagenham Girl Pipers. And if you want to be part of the news why not join our band - all girls and women over the age of 12 are welcome - no prior experience necessary. The Dagenham Girl Pipers – 86 years of traditional Scottish piping, marching and dancing band. The Dagenham Girl Pipers are an all-female marching bagpipe band based in Dagenham, East London. The band was formed in 1930 and have spent the last 86 years touring the country and worldwide at thousands of events. Welcome to the website of the Dagenham Girl Pipers marching band. Here you can find out about our history from inception to the present day (a span of more than 80 years!) and read up on some of our notable events and members. Have you got an event you'd like us to attend - just give us a call or complete our contact form. We'd love to hear from you! If you are interesting in starting a new interest why not join us! It's a brilliant opportunity to join a thriving community based organisation, learn some new skills and make lifelong friends. You don't need any experience, but must be aged 12 or above, just come along on a Wednesday evening (7-9pm) at Eastbrook School, Dagenham Rd, Dagenham RM10 7UR. The Dagenham Girl Pipers are still a vibrant marching pipe band and continue to play at functions and concerts nationwide. They remain a much loved and respected part of the community. The Pipers have been a fundamental part of Dagenham and its history since 1938. The band currently consists of approximately 15 very dedicated and loyal members, who have been with the band many years, some exceeding 50. Now part time volunteers they passionately want to keep the band alive and are still very much in demand for performances. They have participated in the London Mayor's New Year’s Day Parade on numerous occasions, representing the London Borough of Barking and Dagenham and have won the award for the Borough twice in this event. They have made various appearances on television such as the Royal variety Show with Eric Idle and were the pipe band in the BBC production of "The Suffragettes". Pipe Major Sheila Hatcher was honoured by Her Majesty with a BEM in the January 2013 Honours List for her services to the band and the community having been a member since 1958. In 2015 The Dagenham Girl Pipers celebrated their 85th anniversary. The celebration was held in Barking Town Hall and Pipe Major Sheila Hatcher, who joined the band in 1968, was presented with a commemorative rose bowl and flowers. About 30 former members joined the current pipers and enjoyed a film of their performances and speeches from the Mayor and Councillors. If you mention the Dagenham Girl Pipers anywhere in the world today you will find someone who has heard of them, even in places such as New York, Las Vegas, Paris, Australia, South Africa, Oman which are a few places the band has visited. The band is still a thriving organisation and we are always looking for new members. From the age of 12 years old we welcome young girls who live within the Dagenham locality. You do not have to have any experience as we will teach you. We practice on a Wednesday evening from 7 – 9pm at Eastbrook School. Joining Dagenham Girl Pipers is a fantastic chance to learn a multitude of new skills – drumming, piping, dancing, marching, and unique opportunities to perform live in front of enthusiastic audiences. It’s not often you get a chance to join such a fantastic and historic troupe of performers. The Dagenham Girl Pipers were founded in 1930 and are thought to be the world’s first female pipe band. The Dagenham Girl Pipers were formed by Rev. Joseph Waddington Graves in 1930. He was born in 1881, in Deal, Kent. Rev. Graves emigrated to Canada and become a clergyman serving as an Army Padre during World War I with the Canadian forces. On his return to England he ran a Sunday school, and fascinated by bagpipes he decided to set up the marching band. He picked 12 girls (average age 11) from his Sunday school and hired a former Pipe Major to teach them. Pipe Major Douglas Taylor was from the King’s Own Scottish Borderers and already ran a Highland piping and dance academy. It is said that initially he was sceptical about teaching girls to pipe, drum and march as it may ruin his reputation! However he was soon talked into it and the first practice took place on 4th October 1930. An 11-year-old Peggy Iris was present at this first meeting and it sparked a life-long devotion to the band. It took 18 months of tough training before the Dagenham Girl Pipers gave their first performance. This was outdoors at Osborne Hall in front of journalists. Their uniforms consisted of tartan kilts and socks, a velvet jacket and a tam o’shanter. Very quickly the Pipers were in high demand and became a full time, professional organisation, the girls were paid (£5 per week) and had strict rules about no drinking, smoking and no makeup. By 1937 the Dagenham Girl Pipers were performing at about 400 events per year, 4 complete bands could be used at busy times. In 1937 the band toured the world including a visit to Berlin, Germany and appeared before Adolf Hitler. They were in Germany again 2 weeks before war broke out and had to flee the country when they realised the danger they were in. During World War II some of the Pipers joined the Armed Forces, Nursing, Ambulance or Fire services, or had to work in factories or on the land. However many still had time to continue playing for the band and the Dagenham Girl Pipers gave over 1000 shows entertaining the troops and playing for war charities. They even performed in West Africa and the Middle East. After the war the band was able to reform properly and they went from strength to strength appearing numerous times on television and their tours included America, Canada, Europe, Australia and South Africa. Theatrical agent David Land took over the running of the Dagenham Girl Pipers when Rev Graves retired as manager in 1948. The David Land Agency still manages the Dagenham Girl Pipers. In the 1960s it was deemed too expensive to run the Dagenham Girl Pipers as a professional troupe so they reverted to amateur status. The Dagenham Girl Pipers are a loyal and committed troupe of performers and some have had very long and exciting careers with the band. Read up on some of our more prominent members who have given so much time and effort to promote and perform with the Dagenham Girl Pipers, bringing joy to everyone who hears them! At the outbreak of WW2 theatres, cinemas, and other places of entertainment, which would attract large audiences and put their safety at risk of enemy air raids, were closed temporarily. Consequently the work of the Dagenham Girl Pipers came to a temporary halt. Regular band practice was soon restored and members of the band who were employed on war work locally were soon fulfilling the many band engagements that were arising at weekends. These were mainly parades and cabaret work. The war years proved to be a very busy time for the band and there were twenty four band members who appeared on ENSA (Entertainment National Service Association) at various times throughout WW2. In 1942 Pipe Major Peggy Iris and Sergeant Margaret Fraser left England to entertain the troops in the West Coast of Africa and the Middle East. They were both awarded the Africa Star for their work on ENSA. The auditions for ENSA were held in London at the Theatre Royal, Drury Lane. A band of ten members started working on ENSA early during the war and they also toured in the variety show ‘Best Foot Forward’ with Will Fyffe and appeared in pantomime, returning to E.N.S.A. as the other shows ended. Their work on E.N.S.A. finished when they were booked for a new show “Happy and Glorious” at the London Palladium which ran for two years. The next band of ten members formed to work on E.N.S.A. included myself and other members who joined the band during the war. We joined the E.N.S.A. show “Wise and Otherwise” in Tenby, South Wales. Apart from our two head girls, it was our first tour away for the rest of us and the start of our full time work with the band. We were aged between fifteen and sixteen years. We were accompanied by two older members, Betty White and Margaret Williams and later, Eileen Townley. Pipe Major Peggy Iris also joined us in 1945 after her work in the Middle East was over. The managers of the show were Ernie and Renee Shannon who were a song and dance act. The rest of the show included permanent members as well as short-term acts. E.N.S.A. parties were always billeted in E.N.S.A. hostels and these were often big country houses surrounded by large grounds and staffed by N.A.A.F.I. personnel, (Navy, Army and Air Force Institutes). At some of these large houses the N.A.A.F.I. girls would tell us ghost stories and, being very impressionable, we spent a few sleepless hours waiting for a ghost to appear. One in particular that most of us remember is the ghost of the lady in the lake and the night we waited in vain for her ghost to rise out of the water at midnight. It all ended that night when we had given up waiting and were getting ready for bed. Shirley Duffin’s bed was very close to a window and suddenly there was a loud tapping on the window, followed by piercing screams from Shirley and panic from the rest of us. Where we had all been creeping around and whispering, we had now awakened everyone else. We never discovered who had climbed the outside fire escape and tapped on the window but we guessed it might have been another cast member. In “Wise and Otherwise” we appeared at Army camps, RAF camps, aerodromes and Garrison theatres throughout England, Scotland and Wales. We were taken to a different camp each evening by coach unless it was a very large camp and then we would appear for several nights there. The theatres in the camps were mainly large Nissen huts furnished with rows of wooden chairs and a stage with a piano and curtains, all we needed for the cast of ‘Wise and Otherwise’ to put on the show. The officers would be seated in the front rows with other ranks behind them and they were always a very appreciative audience. Dressing rooms were provided backstage with very basic facilities, but we were very well looked after and every theatre, however basic, was very important to us. A highlight for me was when we played several shows at Leuchars naval air base in Fife, Scotland, where my father was stationed in WW1 in the Royal Naval Air Service, at which time he met my mother who was from Dundee. From there I was able to visit family members in Dundee. VE DAY- 8TH MAY 1945.When the war in Europe ended we were based in the ENSA hostel at Catterick Camp. On VE Day the camp was very quiet. We spoke to soldiers during the day and they were all looking forward to getting home and getting on with their lives. There was a formal announcement of the Victory in Europe during the show that night. We were invited to a special celebration dinner at the camp during the next few days, which was attended by many officers and army officials. We also took part in a Victory Parade in the town that week. VJ DAY – 15TH AUGUST 1945.On VJ night we were in Southsea and that was much different. After our show at a camp that evening our company manager organized some cabaret appearances in hotels along the Southsea seafront. Every hotel was packed with people celebrating, mainly hundreds of American servicemen who were billeted in the hotels, and local people. Our entrance into each hotel was chaotic as we piped our way in and struggled to reach the stage. The American servicemen were very noisy and happy to be going home. After six long years the war was over!! Below are the names of twenty-four members of the Dagenham Girl Pipers who appeared on E.N.S.A. during World War Two. Pipe Major Peggy Iris, Margaret Fraser, Jean Harrison, Lily Sims, Selina Lee, Ivy Spooner, Marguerite Sergeant, Eileen Townley,Hilda Creffield, Elsie Spooner, Joan James, Florence Kenningale,,Pat Arnold, Betty White, Margaret Williams, Flora McDougall, Shirley Duffin, Rose Harrison, Jean Vale, Pat Lee, Lucy Wood, Jacqueline Molinsky, Molly Carless and Pat Mason. Find out when and where the Dagenham Girl Pipers are performing next and come and watch! Alternatively why not book us for your next event for a memorable, striking performance guaranteed to be extremely well received. Just give us a ring or complete our contact form. Read up on some of our notable events. Did you know during World War II we performed for the troops in far flung corners of the world? Or that before war broke out the Pipers performed in front of Hitler who said, "I wish I had a band like that." The Daganham Girl Pipers have also performed with many famous stars including Sir Cliff Richard, Rod Stewart, Roy Castle and Roger Moore and for the Royal Family. Welcome to the Dagenham Girl Pipers photo gallery. 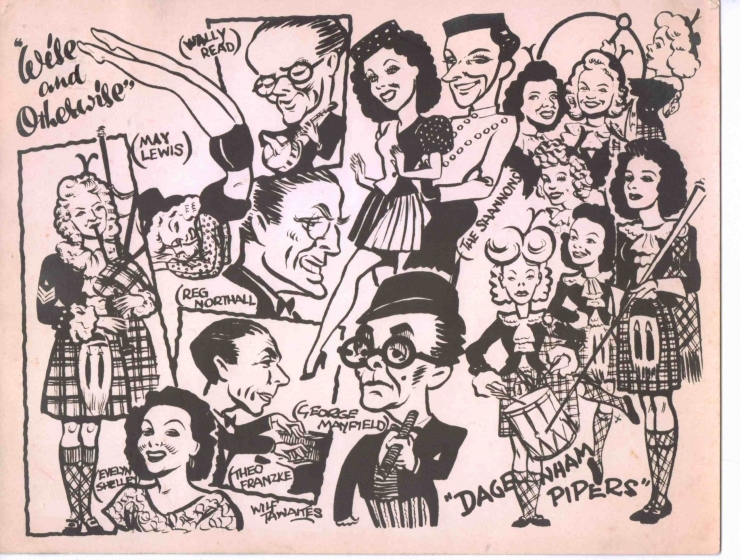 Here you can find images dating back 80 years, showing the Dagenham Girl Pipers appearing at a number of notable events. 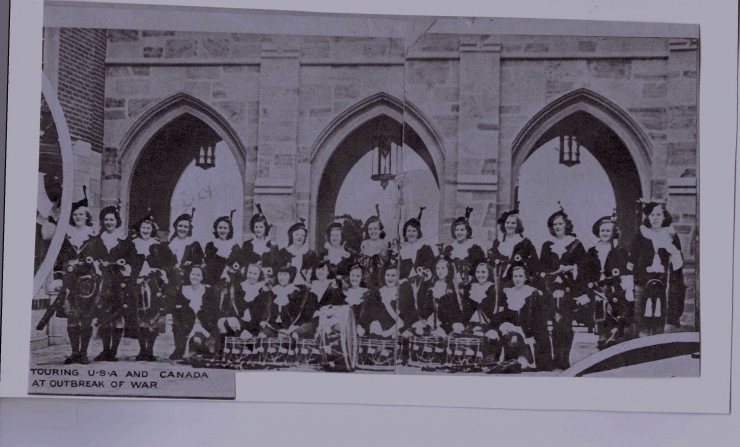 It's a fascinating look back into the archive of the Girl Pipers' history and great oppotunity to see these vintage photos. Take the time to re-live some great moments of the Dagenham Girl Pipers - footage and imagery of the Pipers all set to the fabulous bagpipe music. Some of the videos are live clips of the band performing, others are a montage of photos that are sure to bring back brilliant memories if you've ever seen the girls perform before. Why not book the Dagenham Girl Pipers for your next event - just give us a call or complete the contact form. We'd love to hear from you. The only circumstance where personal data may be shared without consent would be where we are forced to comply with a statutory or court order, or where we were compelled to provide data to supervisory authorities such as the police or HM Revenue & Customs as part of their investigations into criminal acts. International transferal of data does not transfer data outside of the European Union / European Economic Area.